A gable roof is characterized by its very simple elements and design – two upward sloping sides that are joined by a ridge in the middle. It is the most common roof style in residential structures in the US and many other Western countries. It is also used in sheds of various functions. 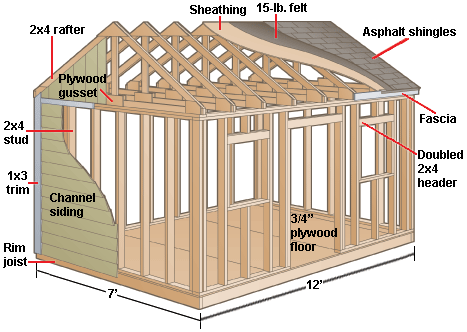 The shape and measurements of a symmetrical triangle at the top is what you’ll see specified in gable shed plans. Sheds with this roof shape is said to be very useful in areas that experience substantial snow and rain. Gable shed plans are recommended if you want a covered storage or workshop area that can withstand harsh weather and snow accumulation very well, as well as requiring minimal maintenance and repair. Its straight and even trusses make the gable shed easy to construct. It can be built fast and inexpensively. As long as the two sides have slopes of the same angle, the roof is considered a gable roof, which has “official” variations across the world, especially as the climate and culture varies. If you compare gable shed plans, you’d notice that the steepness of the pitches may vary. In cold climates the pitches may be steeper than in areas that experience moderate weather all throughout the year. This is to help the snow slide off easily from the top of the shed. As the roof slope goes steeper, so does the price of its construction. Other variations of the gable roof are a combination of function, culture and aesthetics. The crow-stepped gable is the stair-step type of roof design that you’ll see in brick structures in European and Southwestern style structures. This was initially made to gain access to the roof ridge at the time when square bricks were very much available for construction. This served well the purposes of chimney sweeping, roof cleaning, and other similar duties. But since cranes and convenient ladders are now in existence, the crow-stepped gable roof is usually made exclusively for its style. Aside from this, gable shed plans may also feature the cross gable roof, which is composed of two gable roofs joined together to form a right angle. You’ll often see this style in Tudor and Cape Cod designs. Sheds with gable roofs are built generally for their function. Their roof variations in slopes, measurements, materials and designs can be used to suit your place, particularly your climate. Check with a construction professional or a local building inspector which particular gable shed design would be best for your area and your function.